Blink your eyes and somehow we’ve landed in September, but there is no point in living in the past when the future holds so much fun. Scroll through these five local events and make plans for a weekend to remember. 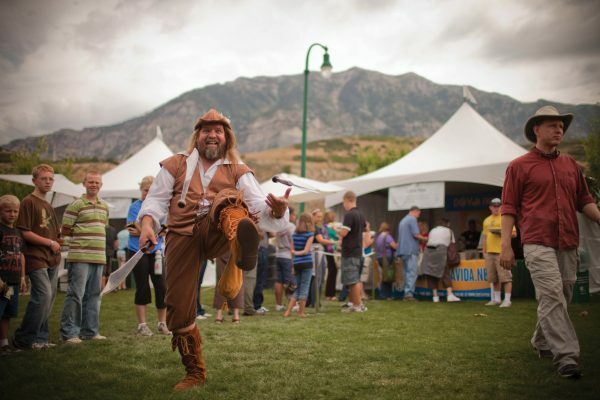 The 29th Annual Timpanogos Storytelling Festival is ready for a second year at its new location — Ashton Gardens at Thanksgiving Point. Get spooked, laugh, cry and escape to a world where stories unfold. There’s the Eiffel Tower, the Leaning Tower of Pisa and a hammock tower. At this year’s Utah Hammock Festival, the group is attempting to break the Guinness World Record for the most number of people in hammocks at the same time. (FYI — the current record is 269 in Germany.) Besides hanging around, there will be midnight kayaking, bonfires, outdoor movie, acoustic concert, hammock giveaways, giant hammock tower, grass volleyball and overnight hammock camping. When: Sept. 7 at 6 p.m. – Sept. 8 at 1:30 p.m. Closing out the 2018 summer concert series, Mindy Gledhill will take the stage for the “Annual Tribute Show: 1994 Mix Tape.” Each year, the Rooftop Concert Series uses one of its popular summer concert nights to share a blast of music from the past. When: Sept. 7 at 7:30 p.m.
Filmquest is rolling out the red carpet in downtown Provo this weekend and throughout next week. The 5th annual festival features independent horror, fantasy and sci-fi film genres and will award filmmakers in 30 different categories. It’s time to go shopping. Tour the aisles of local handmade goods and treats as you find something new for the fall. When: Sept. 6–7, 13–14 from 10 a.m. – 10 p.m.; Sept. 8, 15 from 10 a.m. – 8 p.m.